Twenty miles from the Mosel River, some of the finest vineyards in Germany cling precariously to the slate slopes of the Saar River Valley. Since 1891, five generations of the Mertes family has cultivated vines here in Kanzem, as well as in Wawern, Saarburg and Ockfen. The soils of the Saar are not particularly different from those of the Mosel or Ruwer in composition. Mostly slate, but less uniform than the Mosel, they have less heat retention capabilities. The Saar is a small river, and the vineyards adjacent to it are planted above its tributaries, therefore there is less of a temperature-moderating effect than for Mosel vineyards. The Saar Valley is also at higher elevation, and cooler than the Mosel. These characteristics create difficult ripening conditions at times. In good vintages, however, these cool vineyards can produce some of Germany’s finest, freshest, most well-balanced wines. 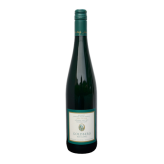 The wines are steelier, racier, more lime-like in their fruit than Mosel Rieslings and possess very fine, precise acidity.